Digital pictures are easy to take, easy to share, easy to accumulate... and frighteningly easy to lose forever if a hard drive fails, gets lost or is stolen. We all know this, yet it’s hard to stay disciplined about making backup copies on a regular basis, especially when photos get downloaded to multiple folders and multiple devices. Until now, that is. Matt Stanchie, founder of Simplified IT Products, devised a simple way to duplicate digital photos for safekeeping after some of his close friends lost precious family photos due to a hardware failure. Called Picture Keeper, it’s a very focused solution. There’s no software to download, no complicated procedures. Simply plug it into a USB port and it starts working. Picture Keeper automatically searches for digital photo files and copies them in their original file format and folders. You can move it from device to device (PCs and Macs), and it will keep on copying your favorite, funniest, most awkward and most treasured digital memories. It’s peace of mind, pure and simple. 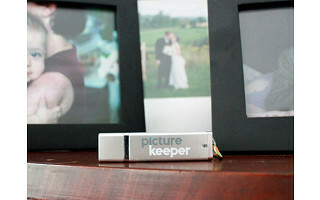 If you’re looking for a SUPER EASY way to back up your digital images, check out the Picture Keeper. This unique USB drive comes loaded with picture-seeking software that will find your images and make a portable copy that you can store/share outside your home. Picture Keeper does all the work for you! Let me know what questions you have. Does it work on both PCs and MACs? Hi Stacey, Yes- the built in software works on both PC's and Mac's. So you can use the same Picture Keeper on all the computers in your home! When are you offering a photo AND video storage? I take lots of videos too. @Soo: It's simple to add additional file types (like video, music, etc) to the default search in the Advanced Options. So you can easily backup your videos with Picture Keeper too! Great idea! I'm ordering one for myself and will probably order more as gifts in the future! Great gift idea for the holidays! When I attempt to place my order, I notice that I am being charged for shipping when I am confirming my order. If I order today, I get free shipping, correct? Do I need a code? Thank you! @Wendy: Thanks for letting us know. It should be working properly now. My photos are on a PC network server that I have defined as 3 different mapped drives (based on subject) on my computer, plus a removable drive. Can it deal with this situation? Also, can you tell it to ignore certain drives? @Jan M: You can include/exclude mapped drives as well as CD/DVD, external/removable drives....anything! But by default, Picture Keeper will just search the "known places" on your C drive. If you choose to, Picture Keeper is highly customizable. I'm assuming it connects at a USB port so no easy way to connect directly to the camera itself, right? If it did connect to a camera that would elimate carrying laptop, tablet etc. on some gear restricted trips. I agree about bypassing the pc's. However knowing the different sizes of usb connections on all of the cameras on the market, this could be difficult. Of course you could get a usb adapter kit to connect to the camera's usb port. This is assuming the software will allow the direct connection. A great idea. I take so many pictures as a hobby, that moving them to my pc is a step i wish i could avoid. I have about 4 bankers boxes full of photos that I would like to store electronically. If I scan the pictures, will the Picture Keeper recognize them? @Scorekeeper: Yes. Most likely your scanner will scan in those pictures as .jpeg files and Picture Keeper will make a backup copy. Can you organize your pictures differently using the device and will it display thumbnails if you wish to use it as a type of external hard drive? @Lori: Yes, you can reorganize your pictures once they are on the Picture Keeper. Also, when you click on "View Pictures" to view what's on the Picture Keeper they will initially show up as thumbnails. Convince me this is better than drag and drop to a plain old ordinary jump drive. @Mindi: Great question. I'm sure that Matt will add to this, but really it's the simplicity of it. In it's simplest format, you don't have to do anything more than click a button. It will search out and save the pictures it finds wherever you may have stored them. The easier something is to do, the more likely it is that we will do it. @Mindi: It's a challenge for many to even know where their pictures are located on their computer. Additionally, most have a hard time remembering what's already been backup vs. what hasn't been copied over. 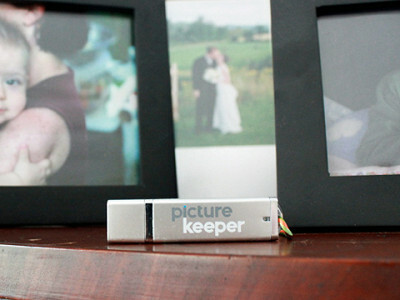 Picture Keeper eliminates those worries. Furthermore, Picture Keeper is designed for the novice computer user who doesn't have the understanding (or steady hand) of Drag and Drop. Also, once one Picture Keeper becomes full, you can use another and it will continue where the first one left off. I haven't found any "plain old ordinary jump drive" that does that. So when I get ready to print pictures, I just plug it in to the printer and print? @Rhosdmom22: Yes, if your printer has a USB port, you can print directly from the Picture Keeper to the printer (as well as the in store photo developing kiosks). so its an overpriced flash drive. for 70 bucks I can buy an external terabyte and use superduper (which is free) and schedule a back up of anything I want. @tmt: You make it sound easy! This is for those of us who aren't as technically savvy to put something like that in place. @tmt: There are other backup options available that require technical user know-how. We feel we've developed a simplistic way for the computer novice to keep their pictures safe! I am not sold on this product but I have to say it is very commendable for you to keep both the pro and con arguments for the product. @John: Thanks for the kind word. We welcome all points of view. As long as it's a civilized discussion (which this has been), not an outright advertisement, then we will let a comment stand. @tmt: I agree. This is ok if yu dont have many pics and dont put them in aplace like picasa and then have external backup someplace. I just bought one and I find it a relaly waste of money. I am sorry I boughtit. @Meredith Tolsdorf: Someone from our customer support team will be reaching out to you so that you can return your product. We don't ever want you to be disappointed in a purchase that you make at Daily Grommet. @Isabel M: In the advanced options, you can request that it back up video files as well. This is great! I've got 3 different flash drive with photos on them and have to manually record what I've already backed up from the computer and which drive they are on. Plus, once I've removed the photos from the computer to save memory, I don't have to search the flash drives to find a certain photo. It will all be in 1 place on 1 drive. I'm sold! *post edited by admin. We have a policy against outside advertising and this went too far in that direction. Commenter uses and recommends Clickfree. I already have Carbonite, which backs up everything including pictures. Doesn't that already take care of the problem? @Daniel Weinreb: Absolutely, if you are already good about backing your memories up you're good to go! 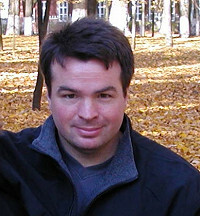 @william safer: Welcome! It will just copy the new photos. Just to let everyone know, I ordered one of these Picture Keepers and it is the greatest thing since the remote control! I have many years of computer experience, and could have bought a flash drive or USB external drive and dragged and dropped each one of my hundreds of photos, but that would take forever. I removed the Picture Keeper from the package, plugged it into the USB, clicked on the area it said to click on, and my photos were downloaded to this backup device in seconds. Get one, or better yet, get two! Also it came lightning fast via Priority Mail. To me one of the best and most useful gadgets of the year! @William S. Safer: Thanks for stopping back to share. We love that it worked so well for you and couldn't agree more that it is its simplicity that makes it a stand-out product. Looks like a marvelous and convenient product - how does it work with a mac? I rely on my iphoto program to organize all of my photos in event and album formats - will this usb system organize them in the same way? Many thanks for your response. @Beth Shedd: It works for both Mac and PC and will keep your pictures within the file structure you have on your computer. We are glad that this looks like a good fit for you! @ Gail: Great question. Stay tune for an answer from the Picture Keeper Team. @ Gail: Thanks for inquiring. In order to back up your cell phone pictures, you'll have to transfer the pictures from your cell phone to a computer, and then use the Picture Keeper to back up the photos on your computer. Please let us know if you have any further questions. I read that you can plug into multiple devices and it will search/save, so my question is about "syncing". If I delete photos on my computer or edit them, would they be removed from the device when I plug it in again (it sounds like this won't happen)? Would the edited photo be saved as a new image on the drive? If I need to make room on the device for new photos, what's the easiest way to delete the ones I don't want to save? I've been looking for a 2nd, smaller backup device to keep offsite. This may be just what I (and my parents) need! Picture Keeper will not delete photos from your computer or from the Picture Keeper. Picture Keeper will save any edited photo as a new image. Picture Keeper only recognizes file names, not images or photos. There is an option on Picture Keeper to view photos. This will open your photos for editing or deleting from the Picture Keeper. Are all the sizes (including the largest 'pro' version) flash memory? What are the actual Memory storage size of each device (not the qty of pictures)? So if I have a photo with the same file name saved in multiple folders it will only pick up one of them? And, if i have an edited copy that wasn't renamed? Does it sort them by date or only put them in filename order? We are attempting to solve this issue with a newer version of the Picture Keeper. Currently duplicate photos in different folders will be downloaded. Picture Keeper downloads the picture in the order that they are saved on your computer. Do you know appx how many minutes of video would be saved with each option if I were I included video under the advanced options? That is difficult to say as videos will vary based on the video bitrate and compression, audio bitrate and compression and the type of program used to create the video. I suggest that you create a small 1 to 2 minute video and see how much space will be used on the Picture Keeper. I know that u can print ie. taking to a kiosk, etc. However, can I share any pictures w/my sister on her computer from picture keeper. I know it will save pics from her computer just wondering if i can transfer from picture keeper to any pc?? Once I have backed up my photos to Picture Keeper, can I open them from Picture Keeper and edit them? Then do I save the edited copy back to the computer or Picture Keeper? I am trying to free up space on my PC, so I would like to delete all pictures from my PC once backed up by Picture Keeper. But I want to make sure I can delete from Picture Keeper and edit pictures from there as well, as if they were still on my PC. @ psheath : PK RESPONSE: Picture Keeper makes a backup copy of the pictures on your computer. Picture Keeper is not designed as an editing package, so pictures CANNOT be edited in Picture Keeper. Also we recommend that you always have 2 Copies of your photos. So typically 1 copy on your computer and a backup on the Picture Keeper. If you want to delete the photos from your computer, we recommend that you have two backup copies. Most of my pictures are stored in Picasa. Will this go into Picasa and get the pictures from there? @ Squigs : PK RESPONSE: Picasa is an image organizer and image viewer for organizing and editing digital photos. Use the Picture Keeper Advanced Option Menu to customize Picture Keeper to find and backup your Picasa photos. However, most image organizers and image viewers use the “Pictures” folder photos and “tag” (special coding) the photos to be used by their software. Picture Keeper will backup the “Pictures” folder by default. When using Picasa, the photos can then be organized and viewed in any order chosen. Is there anything that could happen to this device that would erase the files that have been stored on it?.. @Susan Gallagher: Like most consumer electronics the Picture Keeper is not water proof, and can can be damaged if dropped or mishandled. But through normal use the Picture Keeper will last 7-10 years. Digital pictures are easy to take, easy to share, easy to accumulate... and frighteningly easy to lose forever if a hard drive fails, gets lost or is stolen. We all know this, yet it’s hard to stay disciplined about making backup copies on a regular basis, especially when photos get downloaded to multiple folders and multiple devices.